New Hampshire: Live free or die. My trip to New Hampshire was decidedly interesting. Surprisingly, many people spent December 31, 1999, at home. My friend Vanya and I, however, decided to celebrate Y2K a bit differently. Forsaking the civilized world, we headed north to White Mountain National Forest, so that way when Y2K was to destroy the world, we would be okay. It was a difficult trip, and we weren't able to complete all of our objectives. I did complete my Project 50 objectives, though. Our first stop between home base in Boston, Massachusetts, and our camp "Fort Pahrump" eight miles south of Gorham was at the Massachusetts-New Hampshire State Line, near Salem, New Hampshire. This sign is on I-93, somewhere between 30 and 45 minutes northeast of Boston. As welcome signs on interstate highways go, this one is pretty good. While it doesn't say too much, it looks good while doing it. One interesting thing is that it says, "Bienvenue." 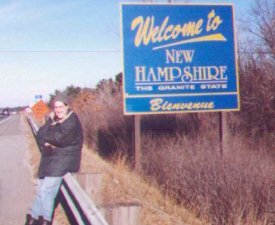 New Hampshire is one of the four states that border Le Québeçois, but this sign is along the southern boundary of the state. There are a couple different varieties; I don't remember the specifics but the one on I-89 at the Vermont state line has a little more on it and I think a little more French too. Kind of interesting, isn't it? The Libertarian mecca of the United States shares a border with a state represented in Congress by an avowed socialist. Well, opposites attract, right? Ying and yang? I always thought that on the map it looks like New Hampshire and Vermont are doing 69 anyway. Oh, just in case you were wondering, we really didn't think Y2K was going to be the end of the world but it's fun to just pretend. Note: On the night of May 2, 2003, the Old Man of the Mountain collapsed. Gov. Benson has announced the formation of a "revitalization" task force. For more information on the loss of the Old Man, please visit the State of New Hampshire's Old Man of the Mountain site. Concord is a quaint small town. Yes, it's just like Delaware, but New Hampshire has character and character is enough. Concord is located in the middle of the southern third of New Hampshire, just north of where I-89 branches off from I-93 and where US-3 meets US-4. Concord was the hometown of Christa McAuliffe, one of the seven Challenger astronauts, and there is a planetarium bearing her name in town. Concord's primary thoroughfare is US-3. It is replete with small shops, although the obligatory strip mall is to the south of downtown. The capitol is on the main drag, right across the street from Republican and Democrat state headquarters. 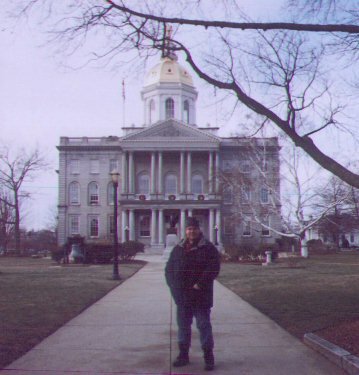 I was in Concord during the 2000 primary campaign (they just keep getting earlier and earlier), so they were filled with Gore, Bush, Bradley, and McCain paraphernalia. The capitol is very small. It is topped by a two-tier rotunda, a eight-sided white riser section with tall windows capped by a gilded dome. The capitol grounds are a Concord city block wide, which isn't all that wide. But New Hampshire is a Libertarian mecca where, Vanya is always fond of saying, legislators only make $200 a year ("That's the way all states should be!"). Though, it bears noting, there are three wreaths adorning the capitol when we visited it three days after Christmas, 1999. One other thing about this picture, it's the first capitol picture I took after I realized I wasn't smiling in any of them. One of the guys I work with looked at them and mockingly said, "I conquer you, Virginia! I conquer you, Delaware!" It's a little easy to forget to do that when you're staring at a camera on a tripod in front of six lanes of traffic. This page loaded in 2.592 milliseconds.